Edmonton, AB – The Edmonton Oil Kings entertain Kelowna tonight in the Rockets’ first ever visit to Rexall Place. It also happens to be a Weiner Wednesday which means the very popular $2 hot dogs will be available all game. Tonight’s game day sponsor Home Depot is also giving away free toques. The following are the game notes distributed to the local media and scouts attending tonight’s game. 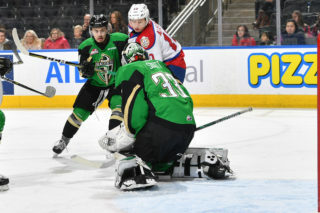 KING SIZE NEWS: The Edmonton Oil Kings are coming off a heartbreaking 3 – 2 overtime loss to the Lethbridge Hurricanes Sunday afternoon. Edmonton rallied back from a 2 goal deficit thanks to goals from Jeff Lee and Brent Raedeke but could not convert on a 5 on 3 powerplay in overtime to seal the deal. Edmonton held Lethbridge to a season low 3 shots in the second period and outshot their opponents for the 20th time this season. At this point in the schedule last year, the Oil Kings were 14-18-2-4 good for 34 points in the standings compared to the 35 points they have in the standings this season. Last year, they went on to win just one of their next 10 games in the New Year. We’re excited to announce that parking is now included with the purchase of advanced-game tickets. Founders Club Members and season seat holders will still have the premium parking at Rexall Place. Any fan that has purchased their tickets in advance, can show their ticket to the parking attendants at the Northlands lot south of 118th avenue or at the Mount Lawn parking lot located at 120th avenue and 74th street for complimentary parking for the remainder of the season! ROSTER UPDATE: The Edmonton Oil Kings 24 players on their active roster including 3 goalies, 7 defensemen and 14 forwards. Edmonton has 13 players returning to the lineup that were here full time last year. There are 10 players starting their rookie seasons including players that played less than 20 games in the WHL in 2007 – 2008. There are also just 11 players on the roster that were here a year ago for the Oil Kings first game of their inaugural season. Geographical breakdown: 9 Alberta , 6 Saskatchewan, 5 British Columbia, 2 Manitoba, 2 Czech Republic. VS KELOWNA: This is second and final meeting of the season between the Oil Kings and Rockets. Back on November 2nd, Kelowna beat Edmonton 5 – 2 at the Prospera Centre. Craig McCallum and Jesse Pearson (with his first WHL goal) scored for Edmonton. Colin Long, Jamie Benn and Dylan Hood all had a goal and an assist for the Rockets in a game that was tied through 50 minutes. Kelowna outshot Edmonton 35 – 24. The Rockets were 1/1 on the powerplay while Edmonton failed to score in 3 powerplay opportunities. 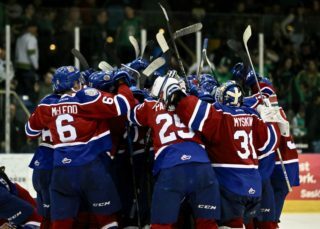 Last year, the Oil Kings lost 3 – 2 in a shootout in the one and only meeting of the season in Kelowna. The last time these franchises met was February 15, 1997 and the Rockets beat the Edmonton Ice 7 – 5. Florida Panthers’ forward Brett McLean had a 5 point night for the Rockets. The Rockets are missing 2 of their best players with Jamie Benn and Tyler Myers representing Canada at the World Junior Hockey Championship. DID YOU KNOW: Jeff Lee has 1 more point than the Oil Kings leading scorers from last season. Tomas Vincour, Brenden Dowd and Craig McCallum had 39 points over the course of 2007 – 2008. The Oil Kings are 8-0-0-0 when they have the lead after 2 periods of play. 2 Oil Kings scored their first career goal last week. Drew Nichol versus Swift Current and Michael Burns versus Chilliwack. 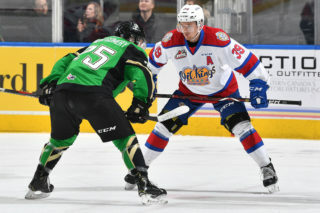 Last Friday versus Chilliwack was the first time this season the Oil Kings were not shorthanded for an entire game. 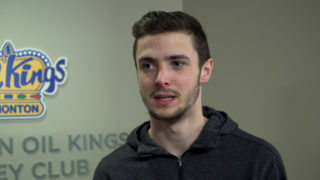 Oil Kings winger Tomas Vincour is ranked 16th on Central Scouting’s Fall Preliminary rankings for the Western Hockey League. The big winger is with the Czech National Junior Team preparing for the World Junior Hockey Championship in Ottawa. Vincour is the second Oil King in franchise history to play in the tournament following Robin Figren’s silver medal winning performance last year. The Czech’s first game of the tournament is against Canada on boxing day. Torrie Jung has 3 career shutouts and 2 of them have been in his 18 games with the Oil Kings. Jung was drafted in the 7th round by Tampa Bay Lighting in 2007. The Edmonton Oil Kings have co-captains. Jeff Lee wears the ‘C’ at home. Brenden Dowd is the captain for road games. The Oil Kings have 3 players that will participate in the Under 17 World Hockey Challenge in Port Alberni, BC and other parts of Vancouver Island. Defenseman Mark Pysyk was just named to Team Pacific while prospects Michael St. Croix and Dylan Wruck will play for Team West. St. Croix currently leads the Manitoba Midget AAA league with a whopping 56 points in just 23 games as a 15 year old. Wruck leads the Saskatchewan Midget AAA League with 51 points in 23 games. STREAKING: Jeff Lee just had his modern franchise record point streak come to an end at 10 games. 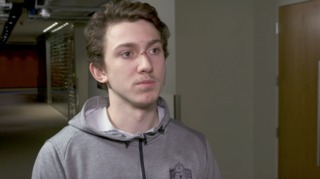 He registered 5 goals and 9 assists for 14 points in that span. Brenden Dowd has 4 points in his last 4 games. INJURIES/TRANSACTIONS: 18 year old goalie Dalyn Flette is out indefinitely with a foot injury he had surgery November 5th. Oil Kings defenseman Jesse Pearson is day to day with a concussion. 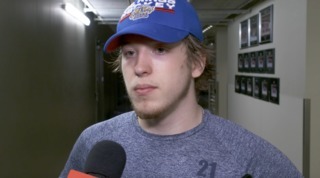 Oil Kings forward Colton Stephenson is out day to day with a concussion. SCHEDULE: Tonight is the last game before the Christmas break. Players will return to their hometowns for over a week to celebrate the holidays with their families and return for a home game December 27th against the Moose Jaw Warriors where we’ll be giving away free Oil Kings water bottles! Following that, the Oil Kings will play in Lethbridge on the 28th and have another home game New Year’s Eve against the Calgary Hitmen. That game starts at 5 o’clock with Louie’s fireworks to follow!